Complaints and FIR is the worst part in an individual’s life. Bollywood celebrities even face these situations and can’t be away from them. 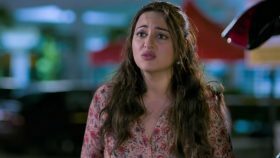 This time it is the Dabangg girl Sonakshi Sinha who has landed herself in worst situation after an event organizer has lodged FIR against her. An event organizer named Pramod Sharma has filed a fraud case against Sonakshi Sinha and her legal team. Did Sonakshi Sinha cheat him? Organizer Pramod Sharma accused Sonakshi for cheating and criminal conspiracy. According to Pramod, Sonakshi agreed to perform in India Fashion and Beauty Award at Sri Fort Auditorium placed in Delhi. Sonakshi was supposed to distribute awards to makeup artists. Sonakshi has even done a shoot of promotional videos and was executed after Sonakshi accepted the amount. Pramod revealed ’’The event has to be taken place on 30th September in Delhi, last year. Sonakshi has even taken an advance payment of 28 lakhs for the event. Pramod further added ‘’I even did all the arrangements including flight tickets, hotel expenses worth Rs 9 lakh.’’ Pramod has incurred huge losses to his Moradabad based event company. Why didn’t Sonakshi appear for the event? The police investigation was taken place on the basis of Pramod’s Fir. Police also declared that allegations against Sonakshi and her team are legally true. Sonakshi even signed a memorandum for the event. Accordingly, Moradabad DSP Gajraj Singh claimed that an electronic money transfer has also been taken place. ‘’ Pramod also submitted a copy of MoU as a proof signed by Sonakshi Sinha. We have ordered the Katghar police station to lodge an FIR against Sonakshi Sinha and her officials. ’’The investigation will now be carried by SSP Ravendra J Gaud’’ officials said. We all yet don’t know why Bollywood celebrities land up themselves in such situations? It is just that they are doing for publicity stunt or they have received a lot of name and fame. Case, allegations, gossips are the daily cup of tea of celebrities and it becomes a part of their personal and professional life. Bollywood superstars sometimes get fame by their work and somehow with allegations too. Further Fir has been lodged against Dabangg girl and her associates. The police investigation has further started, but Sonakshi or any other team official has not yet responded to it.